A diamond conditioning ring is used to quickly correct the flatness of a Hyprez® surface plate. A diamond powder size can be selected from three grits: #60/80, #120/140, and #140/170. ※If the cutting performance is degraded, be sure to contact us for replating. 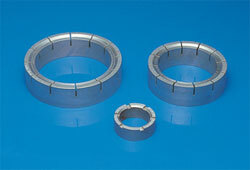 ※A conditioning ring and a mesh in any other size can be manufactured upon request.